Typically, a seasoned .Net developer is all familiar with .Net Eco-system and infrastructure needs to deploy and run .Net applications in a traditional environment. Times have changed. Cloud infrastructure has taken over. On premise infrastructure is considered redundant and expensive. AWS and Azure cloud infrastructure is sought over in most companies. For, folks coming from Windows/.Net background, obviously Azure cloud will be a natural choice. However, it’s a daunting task to make appropriate choice in plethora of offerings provided by Azure cloud. It’s valuable to be familiar with multiple offerings in Azure Cloud. Azure provides impressive choice of tools for every imaginable use case. Be it security, database, analytics, telemetry, deployment, CI/CD Azure Cloud has it covered. For instance, Azure Key vault, Azure Identity Service, Azure Active Directory for managing security needs of your application and automatic scaling to tune performance needs of your application. You may think where do I start? Is there a quick guide to understand everything we need to know about Azure tooling and features? How can we carefully navigate among multitude of options available for running .Net applications in cloud. Here’s a quick guide(e-book) from Microsoft which exactly answers all those questions. This is a comprehensive guide with all details to make decisions about moving into Cloud. Welcome to Azure Cloud!!! 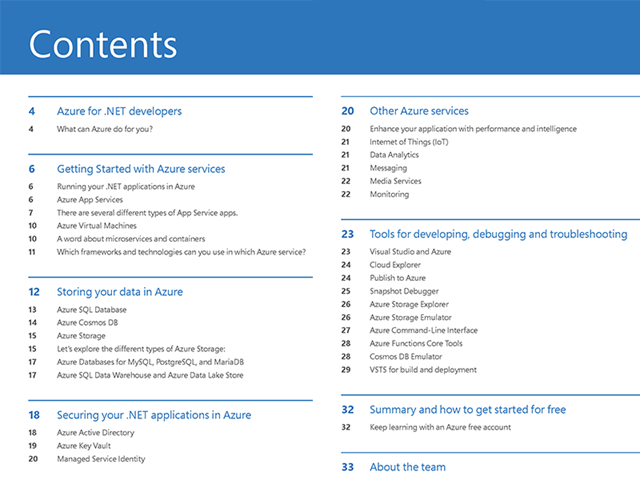 If youâre a .NET developer, weâre excited to introduce a new resource that can help you learn about Azure: The Azure Quick Start Guide for .NET Developers!